No matter how you slice it, there is no summer without watermelon. Royal Sweet or Icebox, seeded or seedless, I’m not finicky about watermelon. According to USDA estimates, each American consumes about 15 lbs. of watermelon a year. By July, I’m way ahead of that mark. The flesh can be any color–red, yellow, or orange-as long as its ripe. If you grow your own, knowing the variety and the days to maturity will give you a ballpark idea as to when you should begin checking for maturity. Then, look for signs of ripening on the both the vine and the fruit. The tendril clos est to the stem end of the melon will turn brown as the fruit ripens. 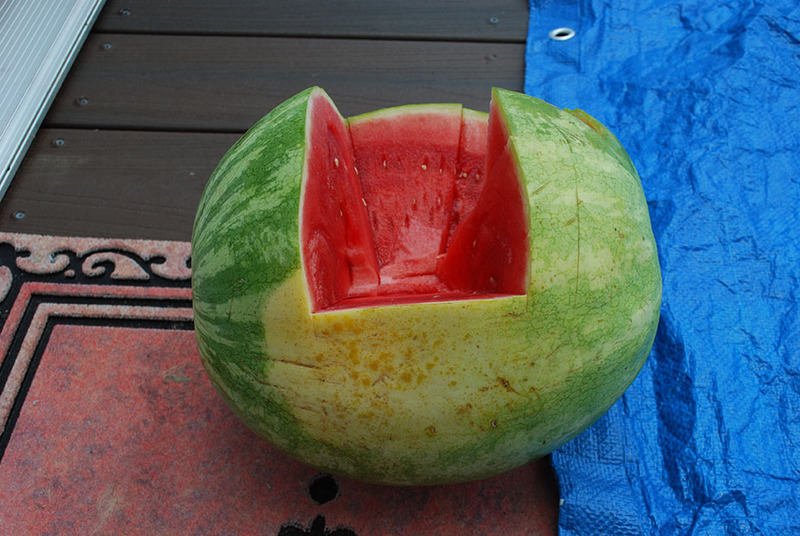 Also, the underside of the watermelon where it rests on the ground will change from green to a yellowish-white. Finally feel the skin. As the melon ripens, the shiny skin turns dull-colored. It will also feel slightly rough, and as you run your hand around the melon’s center you may notice a certain irregularity. Some people can pick a ripe melon by the sound it makes when you thump it. The “thump test” is a more subjective indicator of maturity and requires a good ear. Immature melons have a metallic ringing sound after being thumped. A really deep thud usually indicates a melon that’s overripe. If you eat more watermelon than the average American, visit the SC Watermelon Board web site. It’s for folks like us.